"Father, all the elements of nature obey your command. Calm the storms and hurricanes that threaten us and turn our fear of your power into praise of your goodness. Grant this through our Lord Jesus Christ, Your Son, who lives and reigns with you and the Holy Spirit, one God, forever and ever. Amen." According to the 1962 Missal of St. John XXIII the Extraordinary Form of the Roman Rite, today is the feast of St. Stephen of Hungary. His feast in the Ordinary Form of the Roman Rite is celebrated on August 16. Historically today is the feast of St. Agricolus, son of St. Magnus and bishop of Avignon. He built a church in Avignon to be served by the monks of Lerins and also a convent for Benedictine nuns. By his blessing he put an end to an invasion of storks. The son of a Gallo-Roman senator named Magnus, St. Agricolus entered the monastery about the age of 14, possibly after the death of his mother, and acquired a great reputation for piety and learning. Meanwhile, his widowed father, Magnus, received Holy Orders and became a monk. Magnus was named bishop of Avignon 16 years later, and he consecrated his son, who by then had been a priest for quite some time, to become coadjutor bishop. St. Agricolus succeeded his father ten years later and became famous for preaching and aid to the sick and poor. Depicted here with a dragon, St. Agricolus, like Sts. George, Arsacius and Margaret of Antioch, is considered to have done battle with the devil–not utilizing his own weak human will, but shielded with a crucifix, much prayer, fasting and faith in his Redeemer. 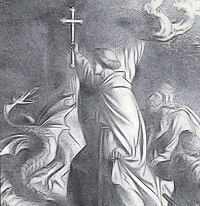 As bishop of Avignon, St. Agricolus worked all the harder for the sake of his flock. He was named Patron of Avignon in 1647.